A total of 37 tuna were landed during the 15th annual Wedgeport Tuna Tournament and Festival weigh-in on Aug. 18–25, with a 680-pound bluefin caught by the captain (Cory Nickerson) and crew of Keepin’ Busy topping the scale to win the Milton J. Comeau Memorial Cup for heaviest fish. 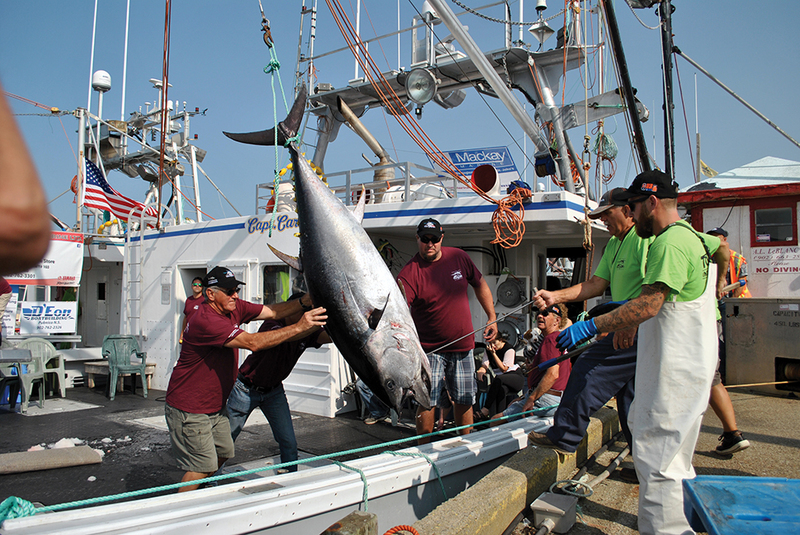 Sixteen vessels participated in this year’s tournament, catching 16 bluefin, 20 big eye and one albacore. The heaviest bluefin caught in the Hell Hole weighed in at 360 pounds and was caught by the Jasmine et Lexie, captained by Andre Cottreau. Bringing in the heaviest overall weight for the tournament was the Blake & Jorgia, captained by John Malone, who landed one bluefin and six big eye tunas that tipped the scales at 1,086 pounds. For researchers from Fisheries and Oceans St. Andrews Biological Station in New Brunswick, the tuna tournament is an event they look forward to every year, providing a prime opportunity to gather samples that are used to help determine the state of the tuna stocks. Hanke said the team sample heads from tuna that are caught, extracting the otolith or ear bone, which can tell them “how old the animal is, where it hatched, began its life and that information is used in stock assessment to assess the status of the population,” said Hanke. Researchers also test the first dorsal fin spine. Managed by the International Commission for the Conservation of Atlantic Tunas (ICCAT), Hanke said scientists believe there are two stocks of bluefins in the Atlantic; a western population and an eastern population. “The eastern population we believe spawns in the Mediterranean Sea and the western population spawns in the Gulf of Mexico, but that’s possibly a little bit narrow minded. Historically we believe there was spawning going on in and around the Canary Islands and the Azores and we’ve even picked up larvae off the Sloped Sea which is south of Georges Bank and are areas outside the normal spawning grounds. The South West Nova Tuna Association allocates 3,200 pounds of bluefin tuna quota from the commercial fishery to the tournament each year. The biggest bluefin landed to date in the tournament was caught in 2014 by the Atlantic Angler, weighing 796 pounds. No Replies to "Annual Tuna Tournament - Important to Scientific Research"